My new year doesn’t start on January 1st, but several days later on January 5th. On January 5th, my life changed forever and it seems easier to mark the passing years and measure the change that has happened based on the day my husband died, rather than when the calendar flips. I find myself stuck living in between the “what is” and “what should have been”. Grief is funny like that. In August, I wrote a letter to Patton Oswalt, from one widow to another. I described grief as a beast, sucking precious energy out of me and stealing moments we should have shared as a family of four, not three. Over the last few weeks, I’ve wanted to reach back through time and warn two years ago me that stuff is about to hit the fan. Keith’s going to the hospital and he’s not coming home. He’s not going to meet the baby you’re still carrying and will never pee off the back deck with your son like he had dreamed. Two years ago me was not prepared for the pain of the secondary losses: the first days of school without dad, the birthdays that measure another year without a dad, and and the quiet, lonely nights that should be full of conversation. I’m not hopeless. I spent last year learning to dream again and found so much hope in 2016. But the grief is still present. The life I expected isn’t the life I’m living and I’m learning how to live knowing those expectations are lost. I have a lot of questions for God and no clue what 2017 will hold, but I’ve decided that’s ok. I don’t have to have dreams or goals or expectations for the year, I just have to live it. Some days living will be busy and loud and fun and other days living will be slow and quiet and hard. Not every day has to be wonderful, but in another year, I’ll be a stronger, better version of myself. Just like I’m proud of the person the last two years has made me. Thanks for your honesty friend. A year of no expectations is very freeing and I pray, healing. Thanks for showing us that Brave can be being okay with things not being okay! You are a gift! Becky, I did not know your story. I do hope your year of no expectations is beyond anything your could have hoped for or imagined. God bless you. 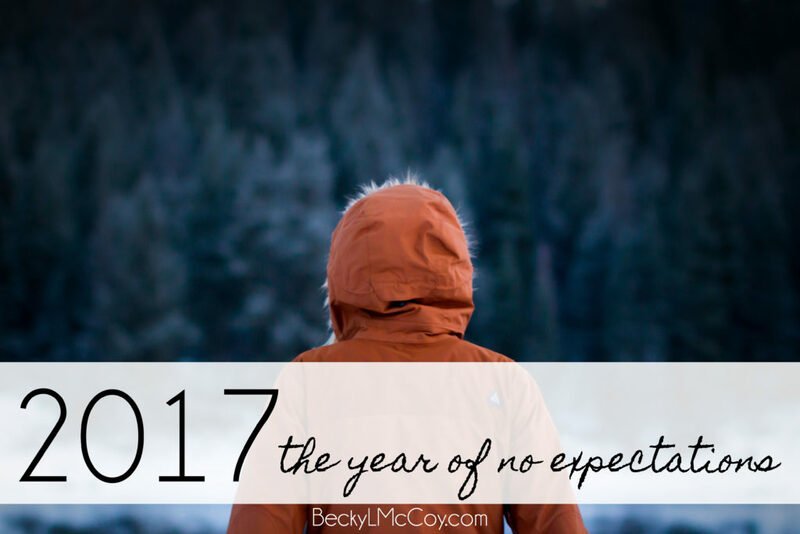 love your honesty sweet Becky and I can’t wait to see what God delivers in 2017! Love you!